Monarch Air Group provides private air charter in Toronto, ON, Canada. Our clients benefit from top-notch service, unrelenting dedication to safety, wide selection of aircraft, and years of experience in chartering private jets. To obtain a free quote, please use our online quoting tool provided below, or call toll free 1-877-281-3051. 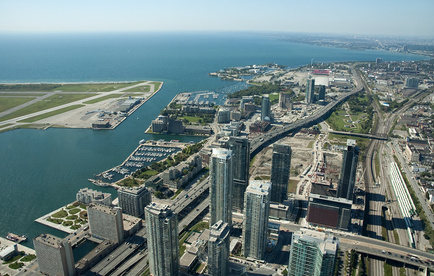 Monarch Air Group provides private jet charter flights in and out Toronto, Ontario, Canada. The eclectic and largest city in Canada, Toronto, is a home to 4 sports teams and the 3rd world’s largest English-speaking theatre district. It is the sister city to Washington, Seattle having its own version of the space needle. Serving as the cultural and business attaché for Canada, the city of Toronto boasts stock exchange, International Film Festival, and Gay Pride Week. There are many parks to visit, the renowned CN Tower that overlooks the Rodgers Centre, one of the busiest gathering country’s sites – the Younge-Dundas Square, and the first permanent IMAX theatre of the world. While being in Toronto make sure to visit the busiest mall in the Toronto – Eaton Centre.